A new report by Carbon Tracker reveals that a large bubble is beginning to grow in the carbon industry. The bubble is forming due to increasing investments in fossil fuel extraction, despite the impending threat of climate change, and the action the world will inevitably have to take to dramatically lower carbon emissions. If all of the proven fossil fuel reserves owned by public companies were burned, 745 gigatonnes of CO₂ would be emitted into the atmosphere. However, if we are to limit global warming over the next 40 years to no more than 2 degrees, we can only afford to burn 565 gigatonnes of CO₂. Factoring in private reserves makes matters even worse: burning all global reserves could potentially contribute 2,795 gigatonnes of CO₂ to the air. A simple application of mathematics means we can only afford to burn one fifth of proven reserves if we are to avert runaway global warming. And that is the source of the carbon bubble. Companies are continuing to look for more fossil fuel reserves and improve extraction technology even though we will only be able to use a fraction of all proven resources. In a world with 565 gigatonnes more CO₂ in the atmosphere, any further fossil fuel extraction would be useless, since it would be pushing the world deeper into catastrophic climate change scenarios. Furthermore, banks, investors, and mutual funds seem to be ignorant of these risks as well. Given the aforementioned news, a mutual fund manager that invests in high carbon industries, looking for a good 20 – 30 year return could be devastated by the eventual burst of the carbon bubble. Even insurance companies are well aware of the risks of climate change and are bracing for the consequences of a warming planet. But this simply underscores one of the inherent problems with markets: they are often incapable of responding in advance to future problems. One columnist from the Guardian has even likened the bursting of the carbon bubble to the recent sub-prime crisis in the United States. The comparison seems uncanny, given the early warning signs we are currently seeing but not acting on. We need governments to step in NOW to properly account for the externalities currently omitted from present-day markets. We need to invest heavily in clean energy and heavily tax or regulate carbon-intensive industries. The stakes are simply too high to continue with business as usual. 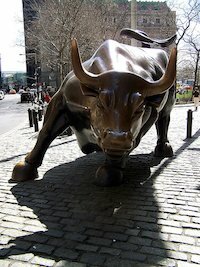 Image CC licensed by Walter Rodriguez: Bull at the New York Stock Exchange, New York. So you’re comfortable with government intervention in order to stop impending environmental doom rather than people acting via markets and as an example of how bad said doom could be you use a crises that was caused almost entirely by government intervention into the housing market? The global financial crisis was “caused almost entirely by government intervention into the housing market?”. How do you figure that? Wasn’t it lack of regulation of new dubious new “investment vehicles”, leading to no-doc, sub-prime loans to people who should not have been given them? And it all came tumbling down.